Where do you hide from the One who is everywhere? Our first father and mother had it very nice. Adam and his bride lived in undeniable paradise; a garden planted by the Creator and given as a gift to the first living things blessed to be images of the Holy One. They were blessed with the overlapping reality of spirit and flesh in a way we could only try to imagine. With every breath, word, and deed, they were literally making history. Earth’s first pioneers were tasked with eating of its bounty and filling it with carbon-copies of themselves, all to the glory of their Maker. They knew no need; they knew no pain; more so, they knew no fear. They experienced a relationship with the Creator that no man or woman has since known; nothing stood between them and the Maker of heaven and earth. Truly, paradise is the term of necessity for what they lived. The story quickly takes a turn for the worse, however, when mankind engages in absolute spiritual rebellion, choosing to honor the words of the serpent over the words of the Holy One. Genesis 3 contains the account of this act of false worship and the staggering punishments it brings about for creation. It is a tragic tale of the loss of trust between those who knew only peace and fidelity. And they heard the sound of YHWH Elohim walking in the garden at the day’s wind, and Adam and his wife hid themselves from the face of YHWH Elohim in the middle tree of the garden. This is not just a proximity to a tree, but literally “in the tree,” that is, they had apparently climbed up into the boughs of the tree and attempted to conceal themselves. The tree in which they were hiding was in the middle of the garden, and that can only mean one thing; they hid in the Tree of the Knowledge of Good and Evil! The very tree from which they ate and sealed their choice to esteem the words of the serpent over the words of their Maker was also the tree in which they sought to hide from His now-fearful Presence! The one place they were not even supposed to be is the one place they decided to hide, because, when you think about it, such an idea would only be logical; if they were being obedient, that is the last place Yah would look – at least to their enlightened senses. 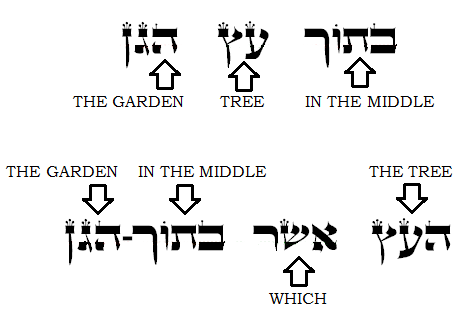 That there be no doubt in the reader’s mind, the Hebrew text itself tells us that this phrase must certainly be speaking about the Tree of the Knowledge of Good and Evil, because it uses the same phrase just a few verses prior to 3:8 to say just that, in Genesis 3:3, where the serpent is speaking with Eve, and she says that the prohibited tree is actually HA'EYTZ ASHER B’TOK HAGGAN – “the tree which is in the middle [of] the garden,” where the KJV again translates it as “in the midst of the garden.” The woman tells us explicitly right in the text which tree is being referenced when we get to the verse about them hiding in a tree! This is made undeniably clear in Yah’s decision to remove man from the garden in 3:22, where He says that if He does not, man will go to the Tree of Life, and from it, shall live forever in his state of perversion. To bring this to an end, it is worthy to note that from the moment Yah calls to Adam and Eve while they are hiding in the tree, all the way through the passing of blame, and through the handing out of the consequences for the crimes committed, there is never mentioned any movement out of the tree. They apparently had not climbed down out of the tree yet. That may sound kind of odd to consider at first, but anything else is actually adding to the text, when the text never says they got down for the conversation. The text presents us with Adam and Eve up in the tree, speaking with the Most High, receiving chastisement for their rebellion. Only through Messiah’s similar presence on the tree would man be set free from his vile idolatrous act. Adam and his bride attempted to cover their nakedness in the tree, and Messiah was shamefully exposed for all to see hanging from the cross. As they received the curses and the rejection of the Holy One, so too did Messiah hang cursed from the wood, crying out His feelings of rejection in the darkness on the cross. And I shall place hostility between you and between the woman, and between your seed and between her Seed; He shall attack your head, and you shall attack His heel. These words surely echoed into the ears of man while his hands and feet clung to the rough wood of the Tree of the Knowledge of Good and Evil. The Redeemer would come and make right their horror. It was on a tree that man received curses for his sins, and so it would be on a tree that those curses would be brought to an end.